Bitdefender is a leading next-generation cybersecurity company that protects the way people work today. Bitdefender provides comprehensive cloud-based cyber security solutions that protect organizations from advanced threats and attacks that target email, mobile apps, and social media. GravityZone Ultra, featuring Endpoint Security XDR, excels where pure-play EDR products are too complex and noisy by smoothly preventing, detecting and responding to sophisticated attacks that evade traditional anti-malware. 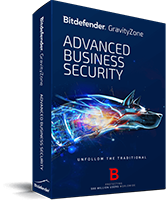 Bitdefender GravityZone Elite sutie is designed to protect enterprises against the full spectrum of sophisticated cyber threats with speed and accuracy. mail servers, delivered by the GravityZone on premise console. by the GravityZone On Premise console. 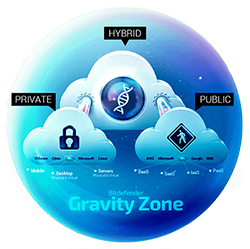 GravityZone Advanced Business Security is an all-in-one security solution that includes protection and unified security management for workstations, servers, email, and mobile devices. 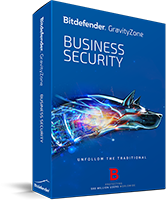 Bitdefender GravityZone Business Security is a bundle of security services designed for small and medium businesses, combining #1-ranked security with the simple centralized management of workstations and servers. GravityZone Full Disk Encryption protects data for the entire endpoint hard drive by leveraging the encryption mechanisms provided by Windows (BitLocker) and Mac (FileVault). 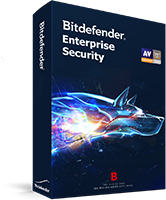 Bitdefender Security for AWS is a security solution designed for the Amazon cloud infrastructure and integrated with the GravityZone Cloud Console. Bitdefender Security for AWS is built for virtualization, offers flexible pricing, and scales to your size and needs for optimal return on investment.